We hope you have had a wonderful year of love and joy, and we are grateful for your interest in Globe Aware and its missions. We really hope we get to share some time with you in 2014 and are always eager to chat with you. Have a blessed holiday season! It’s getting to be that time of year again. Time to fish out those coats and bundle up. Its winter. 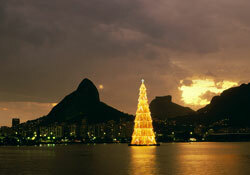 Cultures around the world celebrate at this time of year. So I thought it would be appropriate to take a minute and tell you how some of our program countries choose to celebrate at this time of year. Ghana – Despite religion almost everyone in Ghana celebrates a Christmas celebration. Gifts aren’t a super common occurrence in Ghana due to lack of money. Though when gift are given they are much more practical such as school books, soap , cloth, candles and other useful goods. Christmas dinner is a big event in Ghana. The biggest Christmas dish in Ghana is fufu (type of stew) and okra soup. For decorations the people of Ghana will laden the palm trees with candles. Don’t be surprised to see a group of singing carolers our either. Romania - The observance of Christmas was introduced once with the Christianization of Romania but it was then interrupted during the Communist period (1948—1989), as concepts as religion, Jesus Christ or the Church were banned. In the post-communist Romania, Christmas started being celebrated again more festively. The Christmas and holiday season starts officially on November 30, on Saint Andrew's day and ends on January 7, with the celebration of Saint John. Other major holidays in this period are Great Union Day, Saint Nicholas Day, Saint Ignatius Day, Christmas Eve (named Ajunul Craciunului in Romania), Christmas Day (named Craciun in Romania), Saint Stephen day, New Year's Eve (named Revelion in Romania), and the Epiphany. During Christmastime, Romanian bake or buy various special dishes, including desserts, sweets or fries. Romanians most usually bake Cozonac, a somewhat of a Panetone made of flour, yolks, yeast and many other dependable ingredients, flavors, condiments and additions. There are several types of cozonac, with hundreds of recipes. You can either knead it for hours to be out in 6 hours or you can let it crease for 12 hours to avoid kneading it. You can fill the cozonac with chestnuts, cocoa, raisins or Turkish delights. Other Christmas dishes include piftie, sarmale or pork dishes. 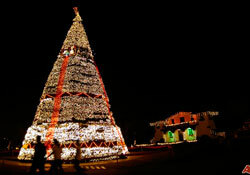 Costa Rica - Christmas traditions in Costa Rica began when Christmas was first celebrated in 1601. 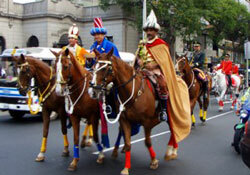 The governor, Don Vasquez de Coronado organized the festivities and declared it a national holiday. Like Mexico, the Ticos celebrate with Posadas the nine days before Christmas. The Costa Rican Christmas is centered upon the Christ child, and therefore, both the Posada and La Portal( the manger) take a very important position in their celebration. The family portal often occupies the majority of the living room. The children collect plants, mosses, grasses, twigs, and sawdust to decorate it. Portals are completed with crafted wood, statues of Mary, Joseph, The Three Kings,and the shepherds and their sheep. On Noche Buena Christmas Eve, The Christ child is placed in the manger just before the family attends the Misa del Gallo Christmas Midnight Mass. A few days before Christmas, the Christmas tree is placed in the home. It is painted white and may be a small Cyprus tree or dried branches from the coffee plant. It is decorated in a homemade fashion with small figurines, lace ornaments and brightly colored strips of paper. The gold star of Bethlehem crowns the tree. The night before Christmas some Tico children will place their shoes out for the Christ child to fill with treats and small gifts. On Christmas morning, those children are asked, "What did the Baby bring you." 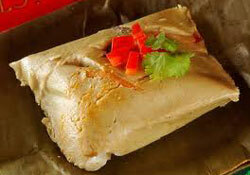 I have added some of the traditional Costa Rican food under our recipe section. Peru - Early Peruvians immediately identified with the festival of Christmas due to the rural nature of the nativity story, where the baby Jesus was born in a barn. Andean Christmases began taking on characteristics of their own, and it is probably the most important celebration of the year. The Andean people put together Nativity scenes in churches and homes, perform dances and plays, and cook typical dishes. Most families buy the pieces for their nativity scenes at the fascinating market of Santurantikuy, (the buying of the saints), held in the Plaza de Armas on the 24th December. They will keep their nativity scenes until La Bajada de los Reyes (the arrival of the three wise men) on January 6. In Cusco, Christmas Eve (known as Noche Buena) is when families get together and celebrate and exchange gifts. Well off families, eat turkey, while for many others chicken suffices. 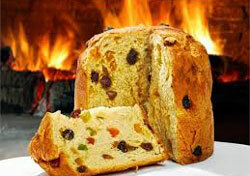 Panetton (a cake/bread filled with fruits) is very popular as are hot drinks of chocolate. In the week preceding Christmas, it is also popular for communities, churches or organisations to organise "chocolatadas" where people who are better off make a Christmas gesture to poor children by offering them a cup of hot chocolate and perhaps a small gift. The lines for chocolatadas are a distinct feature of Christmas in Cusco. 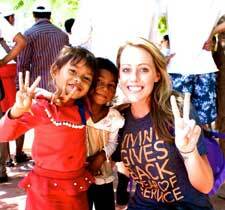 And vote for Caitlin on Globe Aware’s Facebook Page! If you are adventurous and demand complete authenticity, you must start from raw corn ground for tamales (3 lbs, 1.4 kg Maíz cascado, malido crudo). Soak the flour in water then rinse it well, cook with a tablespoon of achiote, and a little of the garlic and peppers in salted water to just cover until tender then stand overnight. The next day, knead it into dough. You should probably have a demonstration first if you're going to try this method. For first timers we'd suggest the Masa version described below. Chop the meat into large (2", 5 cm) chunks then brown on high heat in the ½ cup lard or vegetable oil. Add the chopped garlic, peppers, onion, 1 teaspoon salt, 1teaspoon cumin, ½ teaspoon black pepper, and 1 teaspoon salt for the last minute or two of browning, then cover with water and simmer until very tender (2-3 hours). Remove the meat from the broth and reserve the broth. When the meat is cool shred it finely. While the meat is simmering prepare the potatoes and rice.